Tena Durrani Eid Festive 2018 collection has amazed the lawn lovers with a transmutation powers. The designer introducing exciting prints for casual wear and eid occasion. The designs evolve with contemporary and ethnic mix as well as chic and high-end looks. Tena Durrani has long been one of the staples of the PFDC Fashion Week scene. 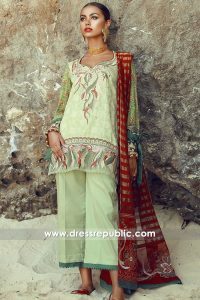 Her femininity brand has gathered her recognized even among the hardest Pakistani fashion market. Tena Durrani Eid Festive 2018 lawn is just a one more reason for which she is one of the most-in-demand fashion designer in Pakistan. …Collection has seasonal looks that are built upon the top portion of the silhouettes. Shirts and dupattas with pants go perfectly with your Eid dinner. One can easily note the floral and geometrical patterns in her new collection that the designer artfully giving us a furtive into our societal attitudes towards global warming. Dress Republic design team liberating the body with fluidity of movement. Each lawn or chiffon suit amply cut and tailored to perfection. We have been working with major lawn and chiffon brands from Pakistan with our state-of-the-art stitching and design services for both retail and wholesale customers. For more information please call any of the following customer service numbers in your country or shop online at http://www.dressrepublic.com/tag/tena-durrani-eid-festive/ and your order will be arrived within matter of weeks by FedEx express shipping services.